Kentucky in and after the Civil War is a topic that has really caught my attention in recent years, and several books I have read and reviewed have added to my understanding of that era in my home state. 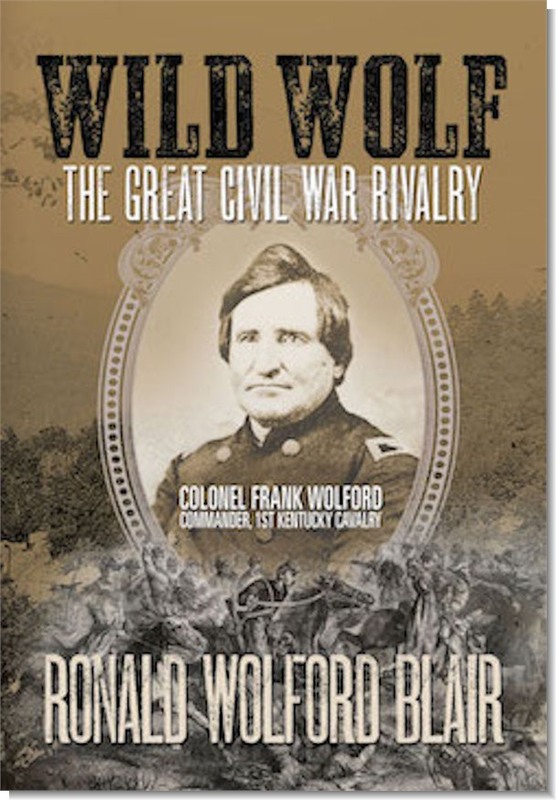 That is true of my latest finished book, Ronald Wolford Blair's Wild Wolf: The Great Civil War Rivalry, about the author's great-great uncle, Union Colonel Frank Wolford of the 1st Kentucky Cavalry, a.k.a. The "Wild Riders." Serving as a biography of the author's ancestor, the book starts by featuring the story of Wolford's military career, especially his many dealings with famous Confederate General John Hunt Morgan, before moving onto discussions of Wolford's polical and social beliefs and how he clashed with the goals and actions of President Abraham Lincoln. The detailed overview of Wolford's military career iincludes his accomplishments as a leader and discusses how his folksy leadership style and manner of giving orders helped him earn his men's admiration. He was certainly no martinet, but earned his men's respect with his manners and fair discipline. His troops fought throughout eastern and central Kentucky and northern Tennessee, including clashes against Morgan's men, before embarking on a long chase of the famed Confederate during his "Great Raid" of 1863. After helping capture Morgan and many of his men, Wolford's troopers fought in the East Tennessee campaign, including the Siege of Knoxville, where they dealt with the usual trials of combat as well as the rugged terrain and bitterly cold weather. As the war moved into the middle of 1864, the story transitions to one of Wolford's political battles and arrests, as the author describes in great detail Wolford's disputes with the Lincoln administration especially his opposition to emancipation and the use of African-American soldiers. Blair also shows how Wolford fought for civil liberties (particularly his own) such as free speech and speedy trials. Wolford was blunt, forthright and honest in his speeches and letters, not caring to whom his remarks were made or know they might be interpreted as aiding the enemy or hurting the Union cause. These political battles started late in the war and continued in the post-war years as he tried to help return life to how it was in ante-bellum days, particularly in the racial hierarchy in Kentucky society. The book frequently notes that Wolford's attitudes and opposition represented those of a majority of Kentuckians at the time. Wolford was an intense and determined soldier and showed the same traits in his non-military fights as well, though he kept his focus solely on events in Kentucky. He may not have appreciated the progress the Union war effort had made nation-wide in 1864 and felt that a re-election of Lincoln would lead to more years of bloodshed. Wolford was, understandably, primarily concerned with the situation in his home state and area ("all politics is local" so goes the cliche) and strongly supported George McClellan in the 1864 election because of the way Steven Burbridge and the Lincoln administration were treating Wolford and his fellow Kentuckians. This work is another valuable look at the complicated, twisted history of Kentucky in and immediately after the Civil War, showing that even a man who made personal and physical sacrifices to help preserve the Union also expressed many sentiments that clashed with his own government in terms of the treatment of slavery and African-Americans as well as interpretation of Constitutional rights and responsibilities. He focused on the civil rights of white Kentuckians, men and women. The story in Wild Wolf is similar to the one told in For Slavery and Union, describing how an individual soldier could fight for the Union but end up opposing some of the Union's political goals. It explores Wolford's political career after the war, as he served as a lawyer, state representative, Congressman and held other official positions as he tried to restore the pre-war social order. He also helped veterans and their families receive government pensions decades after the war. This book is a good study, certainly informative and a great addition to my library, but it is not perfect. The proofreading could have been better, as several grammatical of punctuation mistakes, misspellings and missing words are evident throughout the text. None were huge deals by themselves, but they were minor distractions and there were enough of them that each reminded me that I had seen others previously. Also, the writing at times seemed to jump around from one topic to another and the flow was not always as smooth as it could have been. Perhaps breaking the chapters down in sections might have helped this, though the complicated nature of Wolford's life, career and rivalry with Morgan is a difficult story to tell and there is much more good than bad in this book. Despite my nitpicking, this is a fine book. It does include endnotes and has two large sections of appropriate photographs and maps, which add much to the work. The research that went into this volume is impressive and the amount of material it covers is equally so.The book also includes three appendices publishing Wolford's most controversial speeches and his letter to Lincoln. These were smart additions to this volume. I am pleased to have read this book and do recommend it to Civil War students, especially those interested in Kentucky, cavalry, John Hunt Morgan and/or political dissent on the Union side of the war. It is a good study of a mostly unheralded and unknown cavalry officer and influential political figure in the native state of both Civil War Presidents, showing another example of the complex and confusing nature of war and politics in Civil War-era Kentucky.